Know the history of solitaire kind of amusements in casinos. People have played solitaire card games since the late 1700s. It is believed the first games of solitaire were inspired by people practicing their skills for competitive card games. From popularity in European parlors it grew to becoming a worldwide phenomenon, and in modern times it expanded into the world’s best online casinos. Today there are hundreds of varieties of solitaire card games you can play by yourself, and the advent of computers only have made solitaire even more popular. So, it makes sense that gamblers heading to online casinos may be looking for solitaire games to play. Throughout the history of casinos there have been experiments with offering games of solitaire. In the early days, players paid a set sum for a deck of cards and played their solitaire game. The game would be watched by a dealer, and once the player missed a move the game was over.Winnings were determined by the number of cards played, and there was a bonus for being able to play the entire deck. The struggle in those early days was meeting government regulations aimed at protecting players. Many of the regulations were based on understanding and predicting the odds of winning in each game so players could be protected from fraud. The math that underlies solitaire games were proving tricky to solve, which made the odds of winning solitaire hard to quantify and predict. This also made the games hard to regulate.These games also had other barriers which prevented solitaire from being embraced by the casino industry as it grew. Casinos did not see large profits from those early solitaire games. Other table card games and slots machines were far more profitable. Because each player played the game alone, solitaire would take up a good deal of space on a casino floor. Dealers could watch up to four solitaire players at a time at most, which meant solitaire games required a high level of staffing and a high overhead cost.It was also a slow game to play. This may have been enjoyable for the player, but again, it made the game less profitable for the casino. Another consideration was basic casino floor space. With one player playing at a time, a table version of solitaire took up a lot of space on the casino floor. There was far more money to be made with more space efficient games, such as blackjack, roulette and slot machines, which house more players in the same amount of space. It was for these reasons that physical brick-and-mortar casinos abandoned those early efforts at including solitaire games on their floor or in their future plans. What eventually brought about change for solitaire games in a casino setting was the growth and popularity of computers and computerized games at home, on the go, and in the casino setting. Towards the end of the 20th century, computers became standard in homes around the world, and all of them came with a version of solitaire to play. It was likely quite confusing for many people that a number of the computers included a game called “Las Vegas Solitaire” when there was no version of solitaire being played in any Las Vegas casino at the time. With computer versions of solitaire, advanced math and algorithms helped make it easier to predict and set the odds, which finally allowed solitaire games to fit within government gambling regulations. This has now opened the door to allow casinos to consider future plans involving various forms of solitaire. It makes sense then that new ventures involving solitaire and gambling have come from online casinos offering versions of casino solitaire. Solitaire games have also now been approved in a number of jurisdictions, and video versions of solitaire have appeared in some casinos, resembling a version of slots or video poker. Just like the early versions of casino solitaire, in the online and the computer versions of the game, you pay a specified amount to purchase the deck, and the house pays a return for every card that ends up on the foundation. There is also a bonus for clearing the entire deck. Payouts and bonuses vary from game to game. Some brick and mortar casinos are now starting to offer solitaire in video format, near the electronic slots. There are even versions of solitaire which operate in tournament style, where players can compete for the highest score. It’s unlikely that physical casinos will return to the days of offering solitaire as a table game. 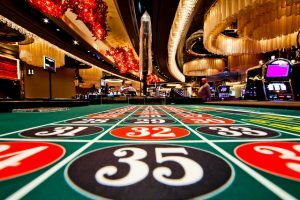 The factors of the size of the game, its labor-intensive nature, and its slow pace are still issues that make the game less attractive to casinos interested in maximizing its profits. Fortunately, technological advances allow players to play video forms of solitaire in brick and mortar locations as well as at the world’s best online casinos.